This movie clip shows a global map of Mars with atmospheric changes from February 18, 2017, through March 6, 2017, a period when two regional-scale dust storms appeared. It combines hundreds of images from the Mars Color Imager (MARCI) camera on NASA’s Mars Reconnaissance Orbiter. NASA’s Mars Reconnaissance Orbiter views back-to-back regional dust storms swelling on Mars. Images from the orbiter’s wide-angle Mars Color Imager (MARCI) show each storm growing in the Acidalia area of northern Mars, then blowing southward and exploding to sizes bigger than the United States after reaching the southern hemisphere. That development path is a common pattern for generating regional dust storms during spring and summer in Mars’ southern hemisphere, where it is now mid-summer. 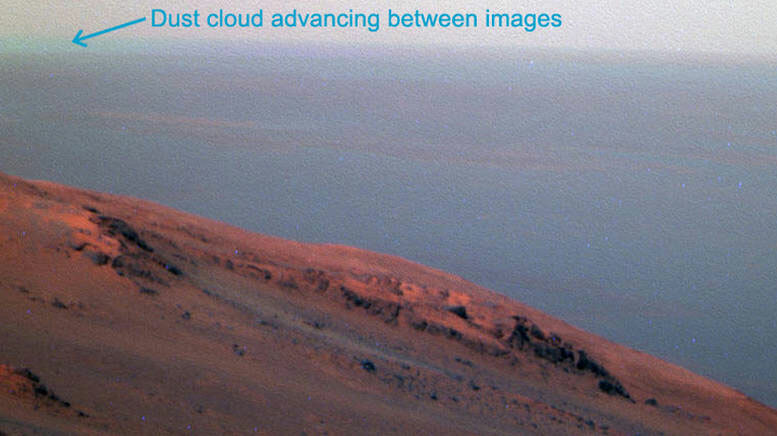 This false-color scene from the panoramic camera (Pancam) on NASA’s Mars Exploration Rover Opportunity documents movement of dust as a regional dust storm approached the rover’s location on February 24, 2017, during the 4,653rd Martian day, or sol, of the rover’s work on Mars. Weather updates from the Mars Reconnaissance Orbiter science team provide operators of Mars rovers advance notice both for taking precautions and for planning observations of storms, particularly in case a regional storm grows to encircle the whole planet. A planet-encircling Martian storm last occurred in 2007. The orbiter monitors storms with its Mars Climate Sounder (MCS) instrument as well as with MARCI. MCS measurements of high-altitude atmospheric warming associated with dust storms have revealed an annual pattern in the occurrence of large regional storms, and the first of these back-to-back storms fits into the identified pattern for this time of the Martian year. Cantor reported the second of the current back-to-back regional storms on March 5 to the team operating NASA’s Mars Exploration Rover Opportunity. The earlier storm, which had become regional in late February, was dissipating by then but still causing high-altitude haziness and warming. “There’s still a chance the second one could become a planet-encircling storm, but it’s unlikely because we’re getting so late in the season,” Cantor said this week. All previously observed planet-encircling dust storms on Mars occurred earlier in the southern summer. Opportunity Project Manager John Callas, at JPL, credits MARCI weather reports with helping his team protect rovers when sudden increases in atmospheric dust decrease sunlight reaching the rover solar arrays. For example, Cantor’s warning about a regional storm approaching the rover Spirit in November 2008 prompted JPL to send an emergency weekend command to conserve energy by deleting a planned radio transmission by Spirit. That saved enough charge in Spirit’s batteries to prevent “what would likely have been a very serious situation,” Callas said. During the most recent global dust storm on Mars, in 2007, both of the rovers then operating on the planet — Spirit and Opportunity — were put into a power-saving mode for more than a week with minimal communication. The early-2010 ending of Spirit’s mission was not related to a dust storm. The same winds that raise Martian dust into the atmosphere can clear some of the dust that accumulates on the rovers. On February 25, as the first back-to-back was spreading regionally, Opportunity experienced a significant cleaning of its solar panels that increased their energy output by more than 10 percent, adjusted for the clarity of the atmosphere. Dust-removing events typically clean the panels by only one or two percent. The Opportunity operations team has noticed over the years that a large dust-cleaning event often precedes dusty skies. Since February 25, the atmosphere over Opportunity has become dustier, and some of the dust has already fallen back onto the solar panels. NASA’s Curiosity rover, on Mars since 2012, uses a radioisotope thermoelectric generator for power instead of solar panels, so it doesn’t face the same hazard from dust storms as Opportunity does. The possibility of observing the growth and life cycle of a regional or global storm offers a research opportunity for both missions, though. Scientists temporarily modified Curiosity’s weather-monitoring regime last week in response to learning that a regional dust storm was growing. “We’ll keep studying this for weeks as the dust clears from the sky,” said atmospheric scientist Mark Lemmon of Texas A&M University, College Station. Sky observations at multiple lighting angles can provide information about changes in the size distribution of suspended dust particles as additional dust is lifted into the sky and larger particles drop more quickly than smaller ones. Be the first to comment on "NASA’s Mars Reconnaissance Orbiter Tracks Back-to-Back Dust Storms"